EL CAJON (4-3-2009) – Should you need just one or two items, why bother going to one of those big-box groceries stores when you can save time (if not money) and head for the corner convenience store. The Foothillers have lighted it up in recent weeks thanks to the top of their batting order, which features shortstop Kimmy Bond (No. 7) and center fielder Natie Emery (11). Among the victories included Tuesday’s (Apr. 2) 11-1 romp over Scripps Ranch in Falcon Fiesta action, as both halves of the batting combo each reached base twice. Headed by catcher Jessica Medlin, who registered five RBI, the bottom of the Grossmont order drove in 10 runs in just four team at-bats to run-rule the Falcons. Joining Medlin was right fielder Rainee (“R.F.”) Foster (3 RBI), and second baseman Halle “Swiss Miss” Sweiss (2 RBI), who recorded a pair of doubles. Meanwhile, Hillers pitcher Samaria Roope spun a 2-hitter. The lone Scripps Ranch run came unearned. 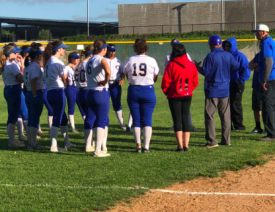 Friday’s game against the 6th-ranked Patriots has been relocated to Grossmont, as the softball diamond at Patrick Henry continues for the second straight year of reconstruction. The San Diego Unified School District, unfortunately, hired just one contractor to upgrade the Patriots’ facility. However, without another company to coordinate a timely schedule, it seems the (unnamed) construction company is really taking its time to complete the project, all to the detriment of the school and its ballplayers. Grossmont is now 10-6 overall, winners in 7 of 8 since falling to Mater Dei Catholic, which was ranked No. 1 in the San Diego Section at the time. Scripps Ranch fell to10-5 overall.